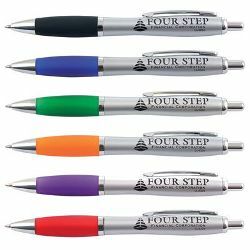 Push button top ballpoint pen with comfort grip. ITEM SIZE(MM) 140L x 12Dia. PRINT AREA(MM) 40L x 8H. COLOURS Silver/Black, Silver/Blue, Silver/Green, Silver/Red, Silver/Orange, Silver/Purple.